Designing new and expanded facilities to serve your distribution strategies. "Over the past 8 years we have relied on F. Curtis Barry & Company for a number of projects including the layout design and systems review for our in-house B to B distribution center, 3PL searches and placement related to our B to C Catalog business as well as operating reviews for our internal and external DC's and Contact Center. With each of these projects F. Curtis Barry & Company has been able to supplement our in-house staff with industry expertise and contacts that we could never feasibly develop in-house. We have found that the team at F. Curtis Barry & Company is particularly good at tailoring a consulting engagement to meet our specific needs whether it is a one day or multi-week project." No matter if you are investing in a new facility, expanding an existing facility, or re-layout an existing facility - there are great commitments of capital, time and labor resources necessary to get the job done right. This is true for not only larger facilities for veteran businesses but also for start-up companies with smaller facilities as well. FCBCO's warehouse layout and design consultants will always be attentive to your warehouse layout and design needs. We will work with you to fully understand what your building and operations requirements and expectations are for your facility. If your operations are in need of a major overhaul before moving into a new facility or expansion, our operations assessments will identify industry best practices that will tie directly into the facility layout and design. FCBCO will work collaboratively with you to develop an efficient and productive facility design that will improve your new or existing facility and operations. We not only develop the layout but will work to educate you on what type(s) of material handling equipment and automation solutions are available for your space and complexity of operation, and how the various pieces of technology can improve and support your operations while positioning your business for sales growth. Gather appropriate metrics and information before and during our site visit to observe your operations and facility. Develop applicable recommendations to improve product workflow, productivity, efficiencies, and space utilization. These may come from a warehouse assessment that we conduct or in recommendations that we develop for your warehouse layout and design project. Consider the operating systems - order management system, warehouse management system or warehouse control system - capabilities to support the facility layout and operations options. Quickly develop 2 to 3 layout options into CAD engineered layout drawings that utilize all that we learn from the site visit and management interviews. Once all of the elements for the options are reviewed and selected, we will then develop a final detailed, engineered CAD drawing for your review and use. Deliver, review and discuss the final CAD warehouse layout and design with management. Prepare the equipment information and specs, budgetary cost breakdown for each piece of equipment, and a best estimate ROI - where appropriate - of all material handling equipment and automation that is included in the new CAD layout drawings. FCBCO has all of our resources within our firm and allows us to utilize a successful methodology to develop and deliver quicker but thorough layout and design plans and material handling equipment and automation solutions pricing along with sourcing for a multitude of manufacturers. Our engineers work directly to not only oversee the implementation of the facility layout but to also make certain that installs are seamlessly completed for all equipment and automation solutions provided by the vendors. This in turn offers our clients a very cost effective solution at a lower risk than having to combine multiple consulting firms to develop the same solution. 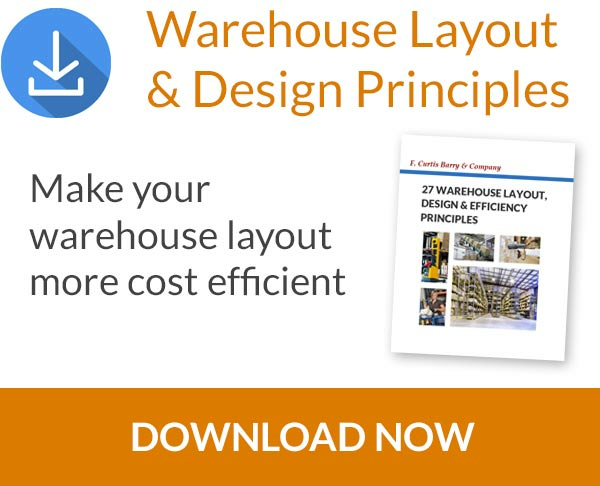 We look forward to speaking with you about your warehouse layout and design project. Please reach out to us at 804-740-8743 or email at info@fcbco.com to schedule a conference call to discuss your project and our consulting services.